Football Fan Jersey (Blank Back or Customized Front and/or Back). 100% Polyester Mesh Body / 100% Polyester Dazzle Trim / Antimicrobial Performance Fabric. Moisture Wicking / Odor Resistant / Stain Release.Worn as a Shirt for Casual Wear or as a Uniform Top without pads (This is a Fan Jersey, Not Game Jersey over Shoulder Pads). Fan Jersey is Available in 6 Different Colors in Adult & Youth Sizes. If ordering Custom, please contact us through Amazon with the Personalization you would like on the Front and/or Back. Football Fan Jersey (Blank Back or Customized Front and/or Back). 100% Polyester Mesh Body / 100% Polyester Dazzle Trim / Antimicrobial Performance Fabric. Moisture Wicking / Odor Resistant / Stain Release. Worn as a Shirt for Casual Wear or as a Uniform Top without pads (This is a Fan Jersey, Not Game Jersey over Shoulder Pads). 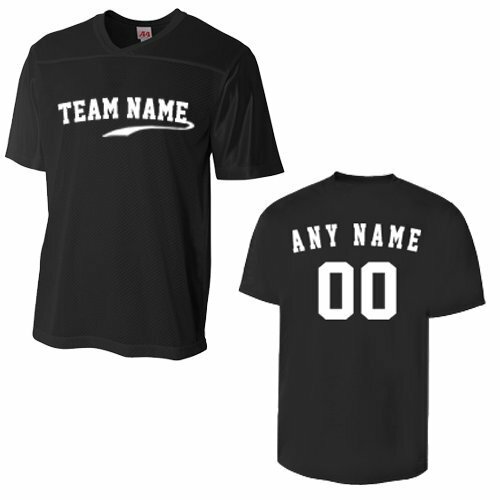 Fan Jersey is Available in 6 Different Colors in Adult & Youth Sizes. If ordering Custom, please contact us through Amazon with the Personalization you would like on the Front and/or Back. If you have any questions about this product by Football Fan Jersey Top, contact us by completing and submitting the form below. If you are looking for a specif part number, please include it with your message.